Being that my "workout" shoes were in the trunk of my car...I really had no excuse not to do Week 1 Day 1 of the C25K Plan. I discovered an android app on the c25k website and immediately downloaded it. I really did not want to have to carry around my piece of paper with the walk/run intervals on it. (and being the control freak that I am, you KNOW I would have... probably even laminated...) Now my phone does it all for me. Count-down clock, total workout clock, a voice (or bell) that says Walk!, Run!, etc., a "check-off" list of what week/day I am on... etc. LOVE IT! Plus it integrates with my own music, so I am all set! I drove out to the cemetery where everyone in town goes to walk (not creepy at all, promise!). I parked my car. I sat there for a few minutes debating on actually getting out of the car and starting. I thought about who would see me. I thought about who would laugh at me. I thought about how miserable and sore I would be afterwards. I wished I had a c25k buddy to do this with. I thought about just hitting a drive-thru and going back to work. Then I made a huge decision. I. Got. Out. Of. The. Car. And I started walking. 5 minute Warm-Up:... fine... but I was breathing pretty hard through it. 90 second walk: I worked on breathing in my nose and out of my mouth. I sounded like a puffing bull. I never did catch my breath before the voice said "Run!" Third 60 second run: I don't really remember this one, but I made it through the whole minute, jogging, slowly. 90 second walk: Did. Not. Last. Long. Enough. Fourth 60 second run: I made it through about 10 seconds, then I started walking, and got choked up. I cried a bit, but realized that was not helping my breathing. At. All. "Just dont give up, I'm working it out"
"Please don't give in, I won't let you down"
"It messed me up, need a second to breathe"
Fifth 60 second run: I knew I was on the down-side of the runs now, I got through about 45 seconds of jogging. 90 second walk: I was ready to cuss the voice that would say "Run!" all too soon. Sixth 60 second run: I just don't remember. I just know that I figured out by now, that I have to look up, and hold my shoulders back... slouching and staring at my feet/the ground is NOT good. 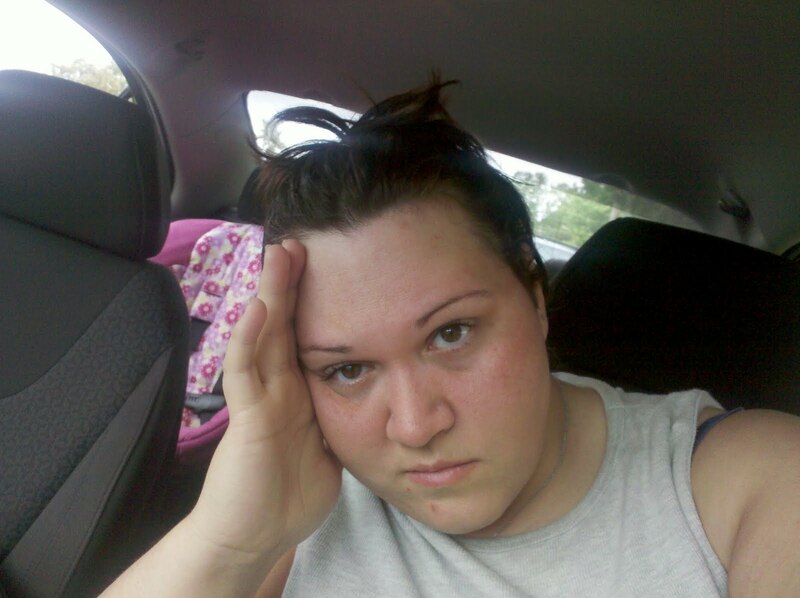 90 second walk: I was sweating really bad, my bangs were in my face, and I was crying. Again. I am pretty sure the man mowing the cemetery saw me. BUT I held my head up high. Seventh 60 second run: By golly, I jogged the entire minute. I felt a wave of intense heat come over me though. I was kinda worried about this. 90 second walk: Thank goodness. Eighth and FINAL 60 second run: I jogged about 50 seconds of the minute. I was still HOT. Very. I stared at my phone screen. 5 minute cool-down: I was too exhausted to be happy that it was over. My head was pounding. My feet felt heavy. My breathing was erratic and I still sounded like a puffing bull. Sweat everywhere. In fact, the only thing I *was* thinking about was how I am just not sure if I can do this two more times this week. Hot-and-still-slightly-red-faced after 10 minutes of full car AC. Miserable. I sat in my car for 10 minutes with the AC on full blast. I managed not to puke. I got back to my office and changed clothes, and got back to work. Now, here I am taking a quick afternoon break to tell you about all of that. 2) I *really* want a treadmill. 3) I am pretty sure that when the rest of the soreness from today sets in, I will not be able to get out of bed in the morning. I believe that you will love it. From all of the reading I've done on forums, you should repeat a day until you can complete it as written. So next time will be Week 1, Day one again. There is NO time limit on this. You WILL be a runner once it's completed. Google "couch to 5k forum" and follow the link if you have time. There is a newbies forum that addresses ALL of the doubts you're having right now. YOU.CAN.DO.IT. BUT- you shouldn't hate it. Be kind to yourself, give this a chance, grab your inner gumption and GO. OOps, I forgot to say that I post at the forum under the same name...so "wave" to me virtually if ya see me around. my Mother in Law has a treadmill she wants to sell. Keep it up, You can DO IT!